New Work Built to Order. All Kinds of First Class Repairing. Rear Hagerstown Bank, HAGERSTOWN, MD. 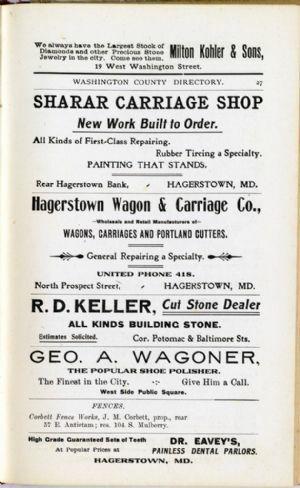 WAGONS, CARRIAGES AND PORTLAND CUTTERS. North Prospect Street, Hagerstown, MD. Estimates Solicited. Cor. Potomac & Baltimore Sts. Corbett Fence Works, J. M. Corbett, prop. rear 57 E. Antietam; res. 104 S. Mulberry. At Popular Prices at PAINLESS DENTAL PARLOURS.